Novana Residence. This is 47 sq.m. 1 bed / 1 bath corner unit. Fully furnished and comes with built-in European style kitchen, lounge and dining areas, king sized bedroom with builtin closet and modern fitted bathroom with hot water shower. Air-conditioning throughout. Balcony overlooking toward Jomtien city. 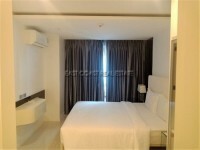 This 8 storey built condominium is located in South Pattaya, with access to all amenities in town such as Night life, Shopping malls, Thai/International Restaurants, convenient shops, etc. Facilities: 24 hour security, communal swimming pool, fitness center, sauna, small garden on the ground floor, underground parking and cleaning service. 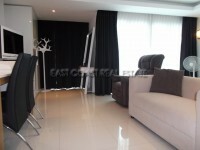 Available for rent with a minimum 6 month rental contract at 15,000 THB/month with 2 month holding deposit.